The Acer Aspire ES1-512 shows that you can actually get more than you bargained for, especially if you manage to purchase this machine during flash sales. 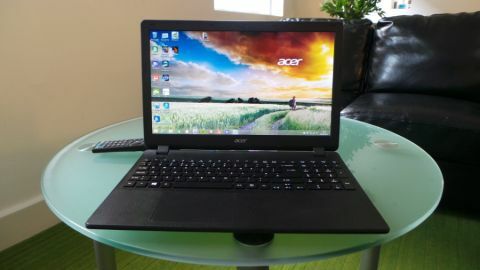 One particular Acer laptop is a hot seller at Amazon and Argos – the entry-level Acer Aspire ES1-512 tops the leader board at both retailers, and this is the model we're reviewing today. The Taiwanese manufacturer chose to stick to a tried-and-trusted formula of bundling as many features as possible for as low a price as it could manage, although in the case of the ES1-512, that price can fluctuate by more than a quarter at the same vendor, depending on when you buy. Online retailer CCL is currently selling the Acer Aspire ES1-512 for as low as £210, a price that includes a free laptop carry case as well as delivery. However, Tesco has sold it for just under £180 in the past (most recently just three weeks ago). The laptop goes head-to-head against the likes of the Lenovo S20, the HP 255 G3, the Toshiba Satellite C50b, the Asus X201 and the myriad of Chromebooks that make up the entry-level segment of the laptop market. There's nothing special about the build of this machine – its form factor and design have been rehashed and reworked hundreds of times in the past by various manufacturers, not to create the perfect form factor but the most functional one. But even then, Acer took a surprising, slightly controversial decision in the process. Whoever designed the ES1-512 thought that placing all the ports at the back of the laptop, just below the hinge, was a great idea. I can't remember the last time a laptop landed in my hands with such a configuration. Having the power socket at the back is commonplace, but ports? There's one good reason why I'm pretty much averse to that idea and it's down to the fact that most people want to see what they're plugging things into. Acer put the HDMI port, one USB 3.0 port, one USB 2.0, an Ethernet port and an audio connector at the back. All of a sudden, connecting those headphones or a USB drive turns into a contortion exercise requiring you to lift the laptop or partially close its display, which in many cases will send the notebook to sleep, hibernation mode or switch it off. Damn technology! As a traditionalist, I prefer my ports on the side, where they are easy to access – the ES1-512 has only one USB port on the left next to an SD card reader, and there's an optical disc drive on the opposite side. Opening the laptop reveals a very generous design thanks to a 15.6-inch form factor. A keyboard with a separate numeric keypad welcomes you – its island-style keys are soft to the touch and have a decent amount of travel, and while they're a bit noisy, it's nothing too worrying. Having so much real estate means that Acer could afford to have decent size "shift" and "enter" keys although the arrow keys are curiously smaller than the ones on the Dell XPS 13 (2015) which uses an 11.6-inch chassis. The touchpad, which is closer to the left edge, is massive compared to the competition but doesn't have any physical buttons. It is totally smooth unlike the textured palm rest surrounding it; the latter reinforces the bland, cheap plastic look of the ES1-512. However, Acer remains adamant that the "distinctive easy-grip" or FlowCurve, sporting a Fibonacci dot pattern, is a "smart design" that will ensure "secure handling in all situations". The display, a 15.6-inch, 1366 x 768 resolution LG-built TN panel, is not that bad, but has definite weak spots – the glare is hideous and distracting plus the viewing angles, even in a moderately lit room, are poor. Stick to sitting in front of it and ignore the reflections and you'll be fine though. While the keyboard had little flex, the same can't be said about the display; bear that in mind when you handle the laptop. The Acer Aspire ES1-512 shares the same underlying hardware as most of its competitors. There's the Intel Celeron N2840, a Bay Trail-M model with two cores clocked at 2.16GHz with 1MB of L2 cache, an Intel HD graphics subsystem, 4GB of RAM (some of it shared with video), a webcam, 802.11n Wi-Fi, Bluetooth and Gigabit Ethernet. As for storage, the 500GB drive is a Western Digital Scorpio Blue model with a 5400RPM spinning speed and 8MB of cache, with an LG optical drive as the DVD writer. A pair of tiny speakers are located on the (elevated) bottom of the ES1-512 so don't expect anything but below-average sound. Other than Windows 8.1 with Bing, Acer bundled a fair amount of applications with this laptop, most of which is superfluous and likely to cause user frustration. I counted 12 Acer applications, three Cyberlink ones, about two dozen games and a lot of random software packages. Adobe Reader, McAfee security, Acer's abDocs and Spotify were running from startup which may detract from the user experience. This machine recorded some of the lowest scores we've seen on a laptop which doesn't come as a surprise given the components used, and this notebook certainly isn't suitable for anything like heavy usage. It managed a paltry 75 points and 5.82 fps on Cinebench 15 CPU and GPU tests respectively, while hitting 518 and 1267 points on 3DMark 2013's Skydiver and Cloud Gate. It refused to run Firestrike despite multiple attempts. The machine didn't fare much better on PCMark 8 Work and Creative (1712 and 1003 points). As for the battery life, Acer claims that its Aspire ES1-512 should achieve up to five hours of longevity, but in our tests we got eight hours (yes, eight hours) which was certainly a very nice surprise.